I received some new Stampin' Up design paper, which I totally love. It is called "Bella Bleu". Ich habe gestern eine schnelle "Baldige Besserung" Karte gemacht. Irgendwie war mir nach distressing und shabby chic zumute..haha Ausserdem habe ich mir neues Stampin' Up Motivpapier gegönnt und bin total begeistert. Es heißt "Bella Bleu". The sentiment is from Whiff of Joy's Fairy Useful Sayings collection, which I designed myself :) The swirl is a QuicKutz flourish die. The center piece of the Prima flower is from Stampin' Up and I also added a rhinestone brad. Have a great weekend and there will be some news on the new WoJ Elisabeth Bell release soon! Der Schnörkel ist ein QuicKutz flourish die. Das Zentrum der Prima Flower ist von Stampin' Up und ich habe noch einen rhinestone brad hinzugefügt. Ich wünsche euch ein schönes Wochenende. Bald gibt es auch Neuigkeiten zu dem immer näher Rückenden WoJ Elisabeth Bell release. Paper Stampin' Up designer paper "Bella Bleu"
what a beautiful card Katharina. Graet card! I love its simplicity and the paper is just gorgeous. beautiful card and I love the flower center. I need to get some of these. I have blog candy, go check it out! 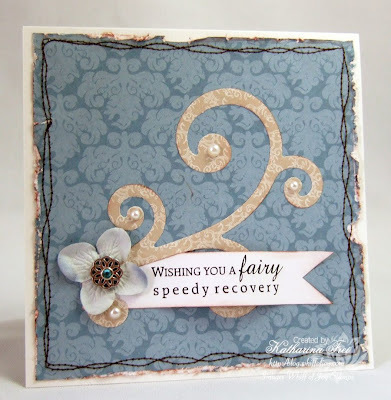 such a beautiful card Katharina, love that sentiment and the pretty flower treatment! Hi Katharina Just beautiful and I love the saying stamp and must invest in some. Love that paper and your detail is perfect! Hello Katharina, I love the beautiful paper and I love the sentiment. Love the elegance in this card! Great colors and wonderful text! so eine schöne schlichte Karte!!! !